This article is a cross-posting from Marketing‘s sister site Macworld Australia. Samsung is getting upset about Apple again. And this time it’s all because of the Olympics and the pesky habit athletes have of whipping out their iPhones when they want to take selfies and crowd shots at one of the biggest sporting events on the planet. Why the chagrin? Let’s start with a little bit of context. Tomorrow (7 February) sees the opening of the 22nd Olympic Winter Games, which is this year being held at Sochi, in the far south-west corner of Russia – about 37 kilometres from the Georgian border on the Black Sea coast. The modern Olympic Games began in 1896 and the event was an amateur affair until the early 1970s, when, under the leadership of IOC (International Olympic Committee) president Juan Antonio Samaranch, international sponsors began to be involved. Today, sponsorship at the Olympics is a big business. A very big business indeed. And it has grown exponentially in recent times. Between 1993 and 1996, Olympic marketing revenue from broadcasts alone was US$1251 million. By the three-year period of 2009 to 2012, that figure had more than tripled to US$3850 million. When you add in ticketing, licensing and all other factors, that figure soars to US$8046 million (all figures from the Olympic Marketing Fact File). There are currently 10 major sponsors of the Olympics, working in four-year cycles – the Olympic quadrennium (which will, therefore, also cover the 2016 Rio Summer Olympics). They’re called The Olympic Partners or TOP and estimates have it that each of them invests somewhere in the order of $US30 billion over the four-year period. It is also believed that for every US dollar they spend in sponsorship fees, these companies must cough up another three or four bucks on advertising campaigns, new product launches and such like. Though this figure is disputed. What cannot be disputed, however, is that we are talking about hefty buckets of cash. So it shouldn’t come as much of a surprise that when a corporation becomes one of the TOP, they want to protect their investment as best they can. And make sure that they get the maximum exposure possible for their brands and products. Much has been written previously about companies trying to piggyback off the Olympics, by the use of sneaky or ambush marketing. It was a practice that drew strict policing during the London Summer Olympics two years ago, with businesses subjected to huge fines of up to $29,000 if they were caught cashing in. But you can’t police the athletes themselves. And this is where Samsung is getting hot under the collar. The 10 TOPs currently contracted to the Olympics are Visa, Atos, Dow, GE, McDonald’s, Panasonic, Procter & Gamble, Coca-Cola, Omega and… Samsung. As part of its sponsorship deal, Samsung is giving every single competing athlete a free Galaxy Note 3. But there’s a catch. 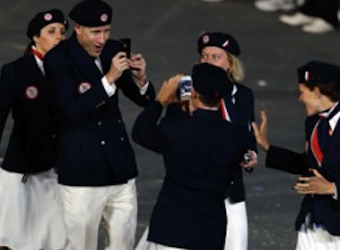 They must agree that if they use an iPhone to take snaps of the Opening Ceremony, they will cover up the Apple logo. The plan was revealed by members of the Swiss Olympic team, who noticed the guidelines that were inserted into the athletes’ gift bags. This doesn’t come out of nowhere, though. AsApple Insider notes, Samsung has had its fingers burned in the past. Just this last week, in fact. In 2012, the South Korean tech giant signed an exclusive deal with soccer great and underwear model David Beckham. But when it came tograbbing a shot of the action at last weekend’s Super Bowl in the US, who was whipping out hisiPhone 5s to get the best shots? Yes, the photogenically gifted Mr B, of course. There was a similar situation with the CEO of US phone carrier T-Mobile, John Legere, using Twitter to spruik Samsung’s latest phablet and Galaxy Gear watch… but doing so from his iPhone 5s. Or Spanish tennis star David Ferrer also falling victim to the Twitter trap, tweeting, “Configuring S Health on my new #GalaxyS4 to help with training @SamsungMobile,” from his… you guessed it. Can the company really be blamed for trying to protect such a major investment? Even if an iPhone with a band-aid or piece of gaffa stuck haphazardly across the back is still very clearly an iPhone and Samsung’s strategy does actually just look a little try-hard. Madeleine Swain is head of content at Niche Media.